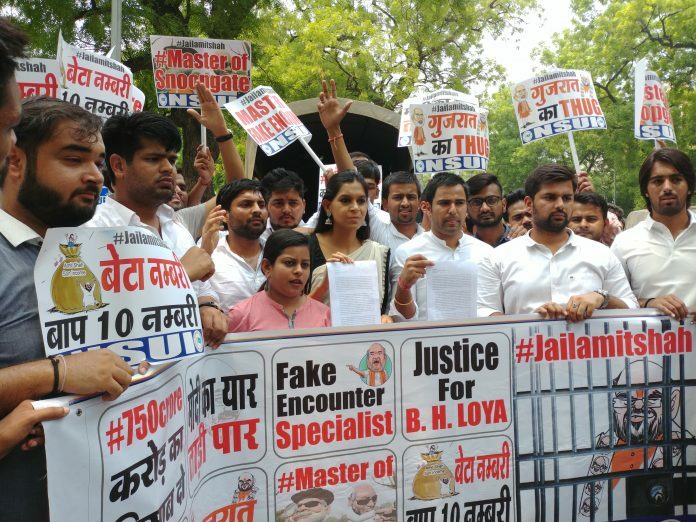 Complaints by the Congress student wing includes the alleged illegal surveillance of a woman in 2009 and Shah’s alleged role in the case of Judge Loya’s death. New Delhi: The National Students’ Union of India (NSUI), the Congress’ student wing, Tuesday said it would file police complaints against BJP president Amit Shah in 100 districts across 28 states in the country. The NSUI is seeking the registration of criminal cases against Shah on the grounds that the BJP president is a “criminal who has misused every government office” he has held, and that he continues to “subvert the Constitution”. “Amit Shah is a criminal implicated in murder, extortion, false encounters, intimidation of witnesses, subversion of judicial process, using state machinery to snoop on a female citizen and corruption cases,” the NSUI’s Delhi unit said in a press release after lodging a complaint against Shah at the Parliament Street police station in the Capital. “There is an attempt being made to reincarnate Amit Shah, a street thug, as a ‘modern-day Chanakya’ but we will not allow this to happen,” said Ruchi Gupta, AICC joint secretary and NSUI incharge. The NSUI said its charges in the police complaints are based on four cases, in which it alleges Shah has used his power to bail himself out. It alleges that Shah, as home minister of Gujarat in 2005, directed police to orchestrate the encounter of Sohrabuddin Sheikh, who allegedly ran an extortion racket with an IPS officer in Gujarat. The NSUI alleges that Shah as Gujarat home minister ordered illegal surveillance of a woman architect in 2009, which it says is a violation of a woman’s personal space and privacy. The Congress’ student wing also alleges that the BJP president had a role in the death of judge Loya, who was presiding over the Sohrabuddin encounter case. According to the NSUI, Shah is linked to the Ahmedabad District Cooperative Bank, which allegedly received Rs 745 crore in scrapped notes during demonetisation, before banks were barred from accepting them. The Bharatiya Janata Yuva Morcha (BJYM), the BJP’s youth wing, termed the NSUI’s actions as just a media gimmick. “There is a bankruptcy of issues within the Congress and its student body and that is why they have resorted to this publicity stunt. They don’t even have any proof against the BJP president,” said Shivam Chhabra, the BJYM’s national media incharge and spokesperson.